There are two sides to the growing discussion of how ecommerce merchants can best use Facebook. One side recommends the setting up a self-contained shopping cart on Facebook, where consumers can complete a purchase without leaving that platform. The other side recommends that Facebook is best used as a traffic source, referring consumers to a merchant’s ecommerce site, where they would complete their purchases. There are benefits to both positions, and liabilities as well. Several larger companies, such as J.C. Penney, have created self-contained shopping carts on Facebook, and moved their entire product catalogs to that platform. Those companies believe, presumably, that the huge traffic and sales potential from Facebook is worth the expense of creating standalone stores. 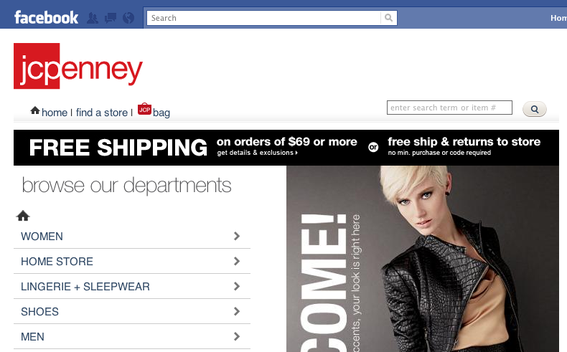 J. C. Penney store, on Facebook. But smaller companies do not have the resources of a J.C. Penney, and they perhaps cannot afford a separate, parallel store, with all the fulfillment, accounting and inventory challenges that such a store would entail. Proponents of the “referral source” strategy point to these complexities. We are going to address this issue head-on, in an upcoming webinar titled “The Great Facebook Commerce Debate.” Paul Chaney, Practical eCommerce’s social media director, will moderate the webinar. He’s a social media expert, and the author of dozens of Facebook-commerce articles on Practical eCommerce. The presenters are two leading, eloquent proponents of each position. Henry Wong, founder and CEO of Adgregate Markets, a provider of Facebook-enabled ecommerce platforms, will argue that merchants are better served by creating self-contained carts within Facebook. Charles Nicholls, founder and chief strategy officer of SeeWhy, a conversion and abandoned-cart recovery firm, will argue that merchants are better served by using Facebook as a referral source. The webinar will assist merchants who are contemplating their Facebook strategies, and how best to use that platform to grow their businesses.